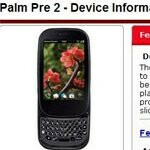 Palm Pre 2 will be landing on February 17th for Verizon? In the never ending guessing game that’s been playing out for some time now, it appears that the Palm Pre 2 will actually see the light here in the US market. Believed to be in cell phone limbo, the latest webOS powered smartphone is positioning itself to become available through Verizon come February 17th. This new revelation comes from an internal product page at a third party retailer, but some wonder if it’ll even have the chance of getting the spotlight seeing that Big Red is readying themselves with the iPhone 4 and the impending amount of new Android sets on the horizon. Moreover, it’ll throw some people into a pickle after seeing what HP/Palm has in store in terms of new hardware at their special event next week. And when you’re faced with the knowledge that there are so many other devices coming out in the near future, will the Palm Pre 2 even have the chance to utter a single word? 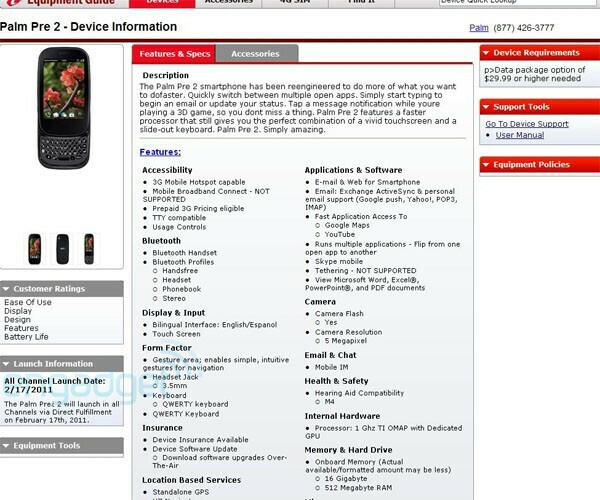 We’ll see how Big Red plays this one out in terms of marketing and advertising for the Palm Pre 2. Yeah this will do well now that Verizon not only has the iPhone, but a slew of powerful Android devices coming out soon. Who cares at this point palm has 2 loyal customers left. The Treo and those phones didnt' use the WebOs operating system which is the BEST! Have you ever experienced it on a Pre or Pixi?? Im guessing not.. I never did get one. Had a Blackberry 7520 or 7250... whichever one it was. It was aight. I was in middle school back when these were popular and didn't have a clue, just thought they looked cool and business-like. The problem with WebOS is the lack of apps. I just upgraded my store's Blackberry to the 6.0 OS, and while it is kind of cool, I want my guitar tuner, TV guide, and one or two other apps that are on my Droid. They just weren't there on Blackberry. I'd wager that app support on WebOS is just as lackluster. Facebook, Pandora, and Weather apps are expected. Palm has to deliver something more. I love web os, but I don't think this will get any sort of impressive sales. I will be picking one up, not right off the back on contract, but as a phone to have definitely. It is a shame that Palm is dying...slowly.... "Valkrye needs food, badly"
Don't count them out yet at least till after the 9th when we see what Hp is bringing to the table at there big event WebOs is the BEST! OS. networkdood, did you really just make an off-handed GAUNTLET reference about the eventual demise of Palm? Classic, I know you can't see it but I just gave you a standing ovation for that one! But yeah, I hate to say it but if Palm doesn't come out with something revolutionary on the 9th...they are done! This second attempt at the Pre is truly pathetic. This is the same phone they put out three years ago, and yes, I have used the Pre and the Pixie and it was a horrifying experience, much like Palm OS at times. Not as bad as Windows Mobile though. Hopefully, they will reveal a whole new line of phones and not try to re-build their brand on one or two devices. Bad timing and wrong hardware. I am a fan of Web Os but all the other devices coming with larger screens and front facing cameras HP should have put out a totally new device or waited til the second quater to put out their new devices. Well well see what they bring to the table new as of the 9th!...Until then Im still enjoying WebOs. Palm Pre can take a hike right over a cliff. The Iphone 4 is where its at. maybe they are just trying to get rid of left over parts... like MS did with the Kins? Yeah I am one of the two palm pre users wanting the 2, you cant beat the ease of use, multitasking works great also. So yes Lexus at least 1 or 2 of us will have a great phone. You cant beat this website for the shear amount of a**holes that post here. HP is a succesful, deep pocket company. If they commit to the cell phones they want to put out, the Web OS will carry them to a good niche in this market. I do agree I would want to distance myself and any new products from the Palm name, simply due to the negative anvil it may put around the new products neck to start with. But I believe quality always finds a home, and Web OS users swear by it. I would love to have more choices. and a**hole postings don't just live here, sscorp99, where ever there is a chance to blog as an unseen idiot, we can depend on people to scream insults instead of just state opinions. Yawn. Hope my store doesn't carry it, it will just collect dust while the droids continue to fly off the shelf.